I just can’t stop loving this. This is the most excellent when agreeing on international meetings. Because if you do timezones in your head you will end up getting it wrong (summer time shifts, etc.) Also I have tried every other world time tool out there, starting from bought iPad and Mac App Store apps. I tried HTML5 apps. I tried Android apps. They all sucked. 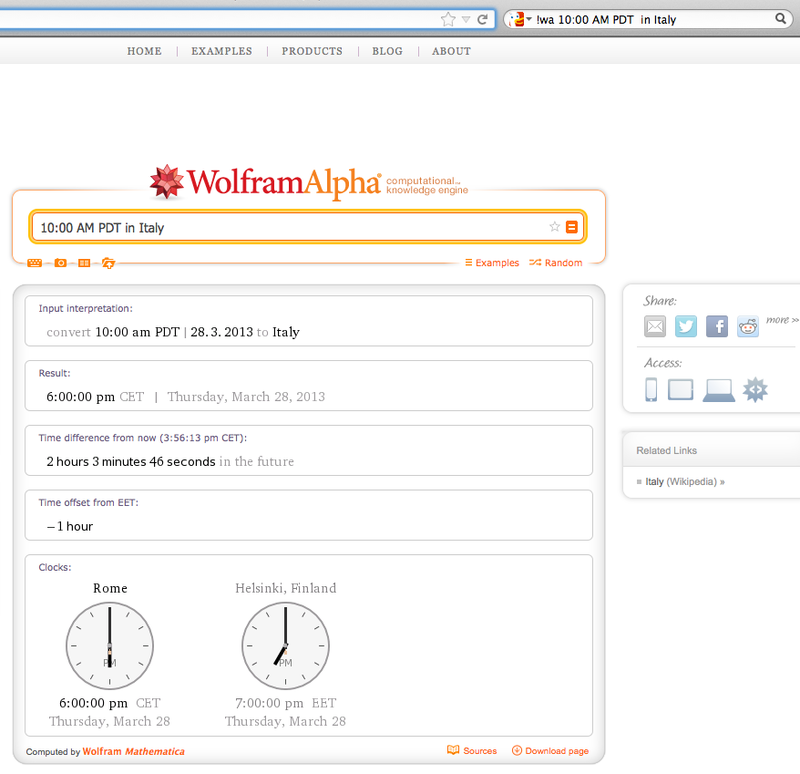 Wolfram Alpha just rocks. And DuckDuckGo makes it accessible for me literally within one second, as I have my browser running all the time when I am working. If I ever meet a person who created this I’ll buy him a beer. Also see my earlier DuckDuckGo power user tips. This entry was posted in Uncategorized, web development and tagged clock, duckduckgo, time conversion, timezone, wolfram alpha, world by Mikko Ohtamaa. Bookmark the permalink. But unfortunately time command cannot do geolookup and timezone mapping based on town, city, state or country.